Order your own copy of At the Gates at your local retailer or online through our website today! Over the course of A Game of Thrones: The Card Game, you have followed your most beloved and most reviled characters from the first pages of A Game of Thrones to the closing chapters of A Dance with Dragons. You have led the hosts of Westeros through the War of the Five Kings and witnessed the fallout of their struggle for the Iron Throne. Characters you may have once thought safe have perished before your eyes and the meek have grown mighty. The only constant in the world of Westeros is change. 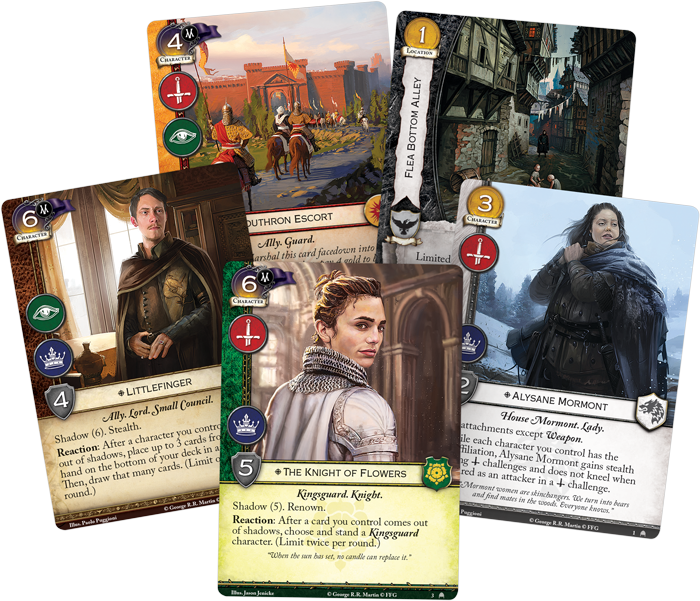 But the realm lives on, and now, the A Game of Thrones: The Card Game takes a new direction with the themes of this cycle. Rather than following the events of A Song of Ice and Fire by moving through the books of the saga, this new cycle draws the spotlight to the vibrant capital of Westeros—King's Landing itself. 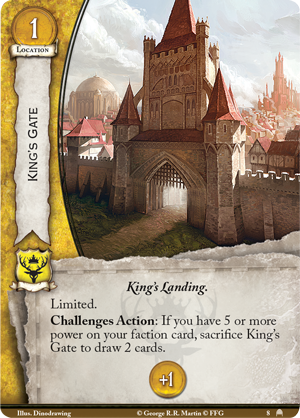 You'll find all kinds of cards throughout the cycle with a tie to King's Landing and the battle for the throne, as well as the continued development of the shadows keyword established in the fifth cycle! 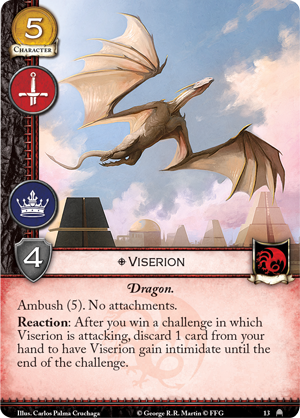 With a host of new shadows cards and support for your shadows decks, the game's sixth cycle promises to bring an exciting new direction to your battles and intrigues across the Seven Kingdoms. 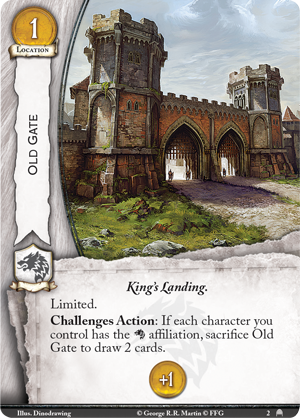 Fantasy Flight Games is proud to announce At the Gates, the first Chapter Pack in the King’s Landing cycle for A Game of Thrones: The Card Game—now available for pre-order at your local retailer or online through our website! 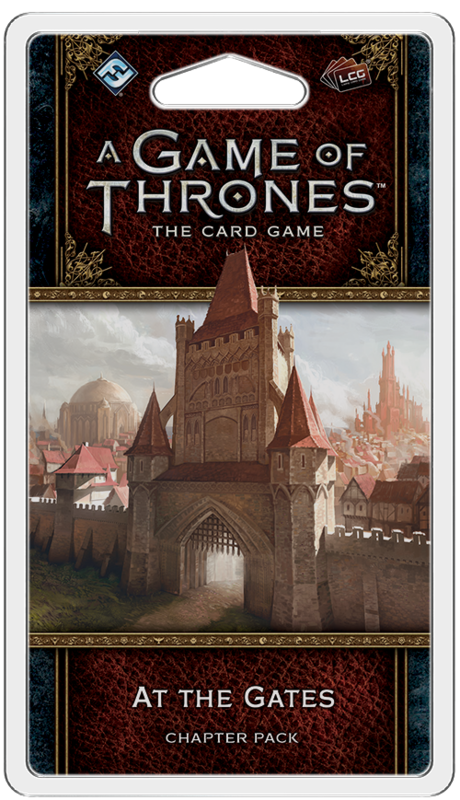 At the Gates marks the beginning of the sixth cycle for A Game of Thrones: The Card Game. 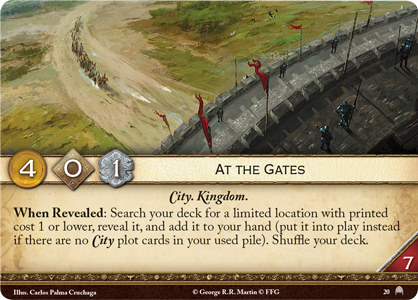 The King’s Landing cycle is firmly centered on the capital of Westeros, focusing on the people, places, and events tied to this location across the entirety of A Song of Ice and Fire, as well as continuing to develop the shadows keyword and the cards that hide in the darkness. The shadows have grown over the years, and the city of King’s Landing has changed since the Starks first traveled south at the command of King Robert, and now you have the chance to explore its twisting alleys like never before. Your journey begins at the great wall that surrounds the city and the scattered gates that connect the capital to the outside world. The number seven is sacred to the Faith, and as such Aegon I Targaryen had seven gates built as the entrances to his grand metropolis. 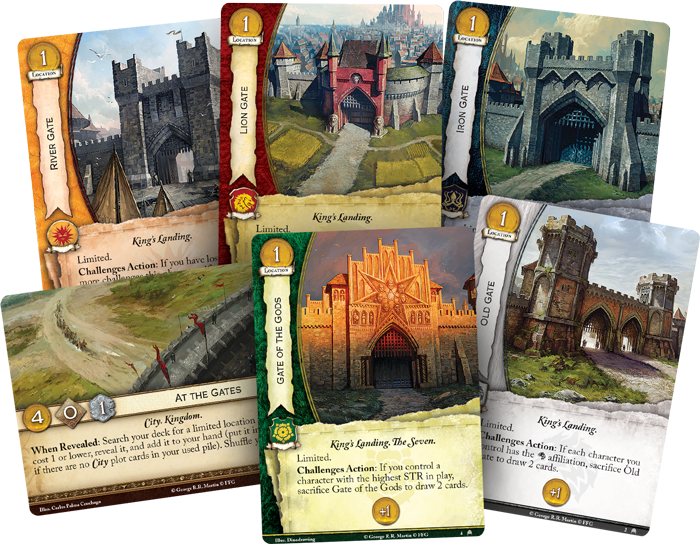 Now, in the At the Gates Chapter Pack, the great Houses of Westeros gain access to these locations. Each gate is a low-cost location that provide you with income from their tolls. If card draw is more important to you than gold, however, you have the chance to sacrifice these locations in exchange for cards. 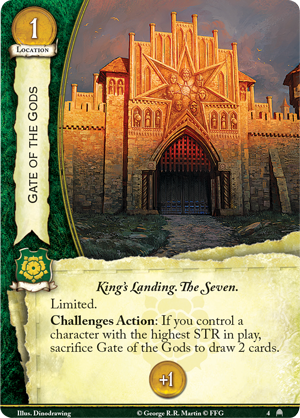 For example, when House Stark is in control of the Old Gate (At the Gates, 2), they may sacrifice the Old Gate to draw two cards if each of their characters are loyal Northmen, while the Gate of the Gods (At the Gates, 4) requires House Tyrell to control the strongest character in play, and the King's Gate (At the Gates, 8) can only be used if House Baratheon has five or more power on their faction card. Bringing these locations into play early is made all the easier with the new plot card, At the Gates (At the Gates, 20). This plot lets you search your deck for a limited location with a cost of one or lower and add it to your hand. If this is your first time using a City plot in the game, you can even put the location into play, allowing you to immediately begin taking advantage of the location. 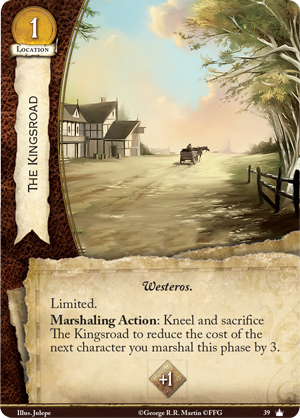 Whether you're searching for one of the new gates or a location like The Kingsroad (Core Set, 39), At the Gates can ensure you get your economy when you need it. Throughout A Song of Ice and Fire, King’s Landing has been likened to a pit of snakes or a city of spiders—all with good cause. 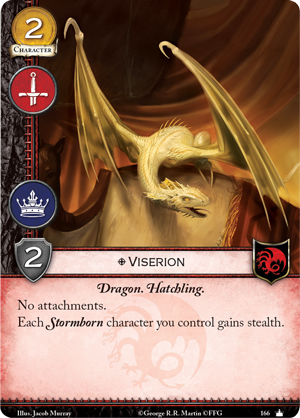 The King’s Landing cycle continues the use of the shadow keyword, which was first introduced to the game's second edition during the Dance of Shadows cycle. By paying two gold, you can marshal a card with the shadow (x) keyword facedown into the separate shadow area, keeping your precious schemes protected until you're ready to strike. If ever there was a character destined for the shadows, it would be the Master of Coin, Littlefinger (At the Gates, 17). Lord Baelish knows that you must play the game of thrones everywhere, at all times, and he is always ready to alter strategies and alliances the moment it suits him. If you can convince Littlefinger to support your claim, he can help you find alternate strategies with his Reaction. 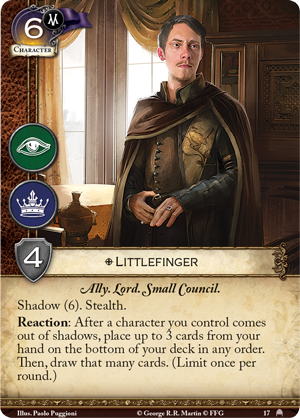 After one of your characters comes out of shadows, whether it's Littlefinger himself or another scheming ally, you can move up to three cards from your hand on the bottom of your deck, then draw an equal number of cards, helping you easily cycle through your deck and find the best cards for your current plans. But perhaps the character who has undergone one of the greatest changes, at least physically, is the dragon Viserion (At the Gates, 13). Growing from his fledgling form (Core Set, 166), the beast’s strength has doubled, and he now bear the ambush (5) keyword, which lets you bring him into play in the midst of the challenges phase. With well laid plans and a touch of luck, you can surprise your opponent with Viserion’s new ability, gaining intimidate after you win a challenge for the miniscule price of a discarded card. After all, the mere sight of a full-grown dragon could be enough to make even a king cower and kneel. As a new cycle begins, you are invited to return to King’s Landing and find serenity in its shadows. But be wary—many have met their end in the ruthless capital of Westeros. Still, if you can turn the chaos to your advantage, glory and power await! Pre-order your copy of At the Gates (GT46) at your local retailer today or online through our website here!